Interrelate Group focuses on the real estate needs and requirements of corporate space occupiers. We develop a keen understanding of the client's overall business objectives, and we then develop and implement real estate strategies that create value. As with corporate users, not-for-profit organizations face workplace decisions that will impact their operations and financial health for years to come. Accordingly, not-for-profit groups require the forward-thinking representation offered by our Not-For-Profit practice. The Interrelate Start-Up Support practice is based upon the belief that intrepid entrepreneurs with new business initiatives deserve to take advantage of the transactional and advisory services usually found being marketed to established organizations. For our clients in Brazil who plan expansion in the U.S., the services that we offer extend well beyond traditional brokerage activities. Our goal is to bridge the cultural, language, and operational differences that often prove to be daunting during the expansion process. 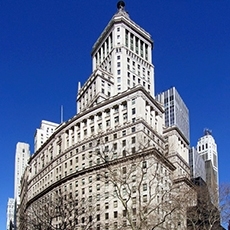 National Federation of Community Development Credit Unions, a nonprofit, was based at 39 Broadway in the Manhattan Financial District. Federation needed to expand its footprint to accommodate its continuing growth even though their lease had four years remaining on its term.